The NEC NP-PX700W2-08ZL is 7000-lumen widescreen DLP professional installation projector with HD/SD SDI input card using OPS technology and ECO Mode™ technology. 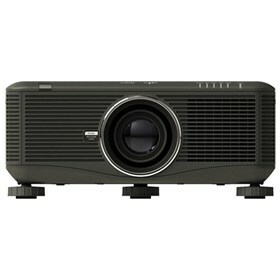 The projector has manual keystone correction, stacking correction capabilities and geometric correction. It features quick power-off, advanced AccuBlend, AutoSense and built-in wall color correction. The NP-PX700W2-08ZL also features HQV™ technology, closed captioning and virtual remote. This projector has integrated RJ-45, HDMI input, displayPort, USB viewer and dual computer inputs for quick-switching between presentations. It has complete line of 6 bayonet-style lenses with built-in lens memory, electronic zoom, focus and lens shift. The NEC NPPX700W2-08ZL has many exciting features for users of all types. See the NEC NPPX700W2-08ZL gallery images above for more product views. The NEC NPPX700W2-08ZL is sold as a Brand New Unopened Item.